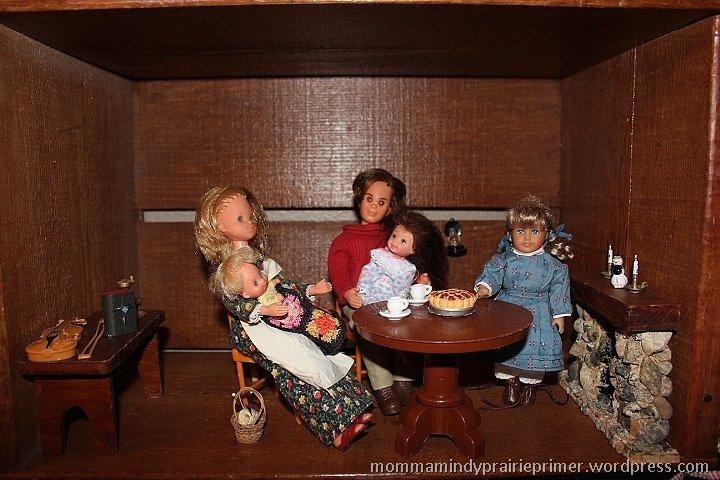 This entry was posted in dollhouse, Homeschooling, Little House on the Prairie, Prairie Primer by Margie Gray, toys and tagged American Girl dolls, Baby Sweets, homeschooling fourth grade, Ingalls family, Kelly doll, Laura Ingalls Wilder, learning styles, Mattel, Sunshine Family, teaching history, teaching with toys, toys for teaching by Mindy. Bookmark the permalink. Oh, I love this! How adorable…. particularly the sweet, little stone fireplace. I don’t have any ideas about a dugout, except like you said build one outside, but it is pretty rainy and cold around here to do that. I just love how you are trying to use the things around your house to add to your scenes. I think the paper- mache will work best. I’m thinking of taking a cardboard box, cutting out the door and a window. Place it on a heavy piece of cardboard. Mix up your glue and ribp your newspapers and start layering. I think you can even add a little shape as you go. You can even lay some on the ground.. dry, paint, use glue to add moss or some other covering. I think you have done some fun things and my 7 year old and I are about to begin the Prairie books next week. Elizabeth, I love that idea! I keep trying to imagine it in my mind, but nothing is clear, except how I want it to look in the end. I’m excited you and your child are beginning the study, you will have SO MUCH fun learning! Thanks for leaving a comment. Hope I get to see your finished projects! So fun ! You are amazing Mindy !